Raumfahrt+Astronomie-Blog von CENAP - Blog: Raumfahrt - Weltgrößte Sonnensegel, Sunjammer, schließt erfolgreich Test ab. Bringt damit Propellantless Space Technology einen Schritt näher zur Realität. Tustin, CA - NASA officials, team partners, and local students were on hand to witness a key milestone for the Sunjammer Mission as it successfully deployed a quadrant of its solar sail - a critical design component that will eventually herald an era of propellantless spacecraft. 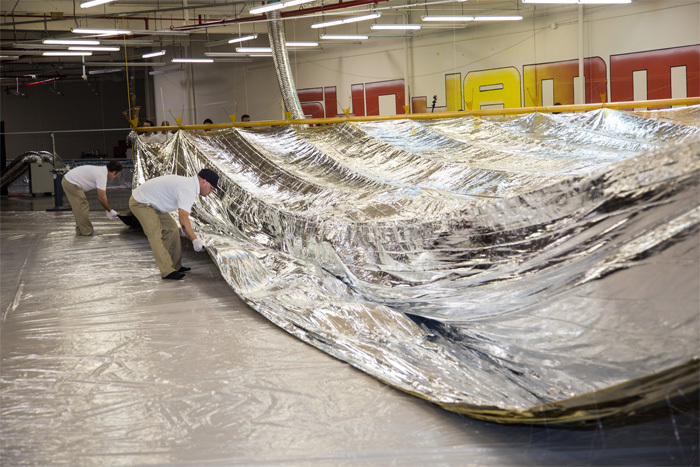 Sunjammer will be the largest solar sail ever flown using photonic pressure (or sunlight) to maneuver in space. Solar Sails have the potential to be a game changer for space exploration as the low-cost, propellantless and highly maneuverable sail craft will enable future satellites and spacecraft to journey throughout the solar system and beyond. The prime contractor, L'Garde Inc., hosted the test deployment at its facility in Tustin, CA, with mission partners NASA and Space Services Inc. present for the event. The test is a critical milestone for the Sunjammer Mission as lead contractor L'Garde, Inc. demonstrated for the first time the successful coupling and deployment of the sail and deploying beam. The beam pulled a quarter of the sail out to its full open state as it will operate in space. 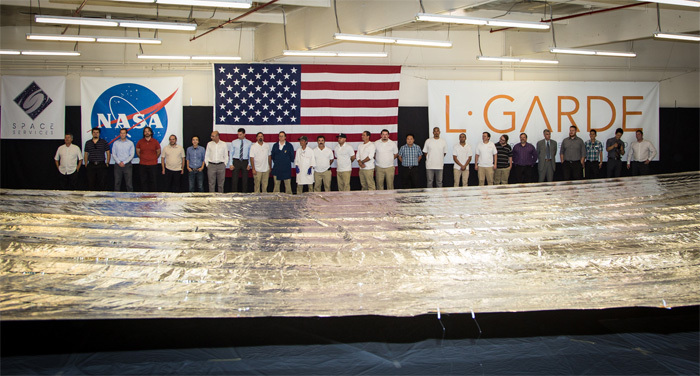 The demonstration was conducted under more stressful conditions since the Earth's gravity and atmosphere make it more difficult to test given the lightweight sail material. "If this test succeeded under these stressing conditions, we certainly anticipate it will work exceedingly well in space" said Nathan Barnes, President of L'Garde. We are very pleased by these results, as they bring us one step closer to realizing NASA's vision of a propellantless spacecraft and introduce the exciting potential of solar sails to the world," said public outreach partner Space Services CEO, Charles Chafer. Sunjammer is slated to launch in January 2015 and is NASA's first solar sail voyage to deep space. It will monitor key solar activity as well as carry a public "Cosmic Archive" of human perspectives including names, messages, photographs, and videos contributed by the public for future generations to discover. Space Services Holdings is the exclusive commercial infusion partner for Sunjammer solar sail mission, providing opportunities for mission sponsorship; developing and operating the mission website; and conducting - in partnership with NASA and selected partners - an extensive education and public outreach campaign for the mission. For more than 30 years Houston, Texas-based Space Services Holdings, Inc. and its heritage company Space Services Inc. of America have been recognized as the true pioneers of the commercial space industry. In 1982, Space Services - under the direction of legendary Mercury astronaut Donald K. "Deke" Slayton - conducted the first privately funded launch into space, establishing the business, legal, and regulatory framework for today's commercial industry. In 1997, SSHI's subsidiary Celestis, Inc. conducted the first ever Memorial Spaceflight, launching a symbolic portion of the cremated remains of Star Trek creator Gene Roddenberry, 60s icon Timothy Leary, and 22 others from around the globe into Earth orbit. Since then Celestis has conducted 10 additional Memorial Spaceflight missions, and placing more than 1000 flight capsules - including Mercury astronaut L. Gordon Cooper, and Star Trek actor James Doohan - into outer space. In 1999 NASA asked Celestis to assist them in honoring Dr. Eugene Shoemaker by making him the first person "buried" on the moon on the Lunar Prospector mission. Today, SSHI is developing commercial space weather technologies and systems to deliver timely, accurate forecasts and warnings for solar storms. Through a series of contracts funded by the National Oceanic and Atmospheric Administration (NOAA) and its own resources, SSHI has created, and is executing, a focused business plan to meet global space weather data and information needs. L'Garde aims to be a world leader in the development of inflatable and deployable structures for terrestrial and space applications. L'Garde is focused on providing agile and responsive research and development services to its customers. L'Garde was founded in 1971 in Orange County, CA to support ballistic missile defense through the development and manufacture of inflatable targets and decoy systems. Since that time L'Garde has developed a wealth of knowledge about deployable space systems that include targets and countermeasures, deployable space antennas, in-space propulsion, deployable space structures, and deployable terrestrial systems. L'Garde has placed more than 150 objects in space. L'Garde's capabilities embrace deployable antennas, space propulsion, space structures, and missile defense targets and countermeasures. With the Sunjammer Solar Sail Technology Demonstration Mission (TDM), L'Garde will advance the state of the art of solar sailing. The end goal of this mission is the deployment, flight, and navigation of a mission capable solar sail to demonstrably prove the efficacy of solar sails. This proposed mission will definitively advance the technology of solar sailing for use by future mission planners. Debris collection and removal from orbit. 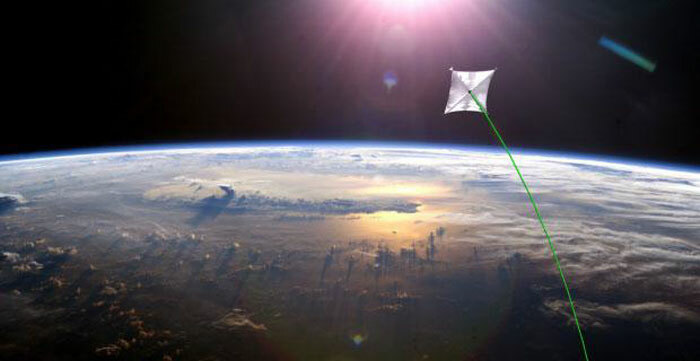 Debris can be captured and removed from orbit over a period of years using the small solar-sail thrust. De-orbit of spent satellites. Solar sails can be integrated into satellite payloads so that the satellite can be de-orbited at the end of its mission. Creating pseudo-Lagrange points by cancelling some solar gravitational pull with the sails. As an example, the GeoStorm project considers locating solar storm warning satellites three times further from the Earth increasing warning time from 15 minutes to 45 minutes. Providing synchronous satellites at non-equatorial latitudes, such as the “pole-sitter” project. This allows the northern and southern latitudes to gain the advantages of synchronous satellites. Providing deep space propulsion. Payloads free of the Earth’s pull can be accelerated to the other planets, or out of the solar system, such as those proposed for Project Encounter. Demonstrate segmented deployment of a solar sail with ~4X the area of that vacuum tested at Plum Brook, “cookie cut” from the center of a much larger sail. Demonstrate attitude control plus passive stability and trim using beam-tip vanes. Execute a navigation sequence with mission-capable accuracy. When satellites reach the end of their working lives, they may continue to orbit in a dormant state for many decades. In a project funded by ESA, Surrey University (UK) has developed a new technique for deorbiting ageing satellites in a safe manner. 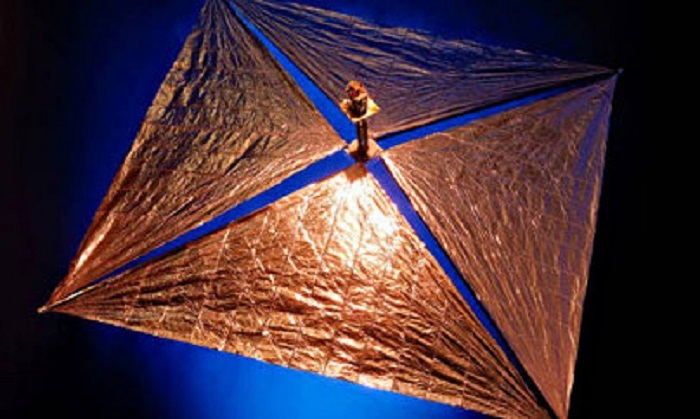 By unfurling an ultra-lightweight “gossamer sail” to increase aerodynamic drag, a deorbiting satellite more quickly leaves Low Earth Orbit (LEO) and disintegrates in the Earth’s atmosphere, reducing the risk of catastrophic collisions and helping to maintain a sustainable space environment for future generations. When not in use, the Gossamer Deorbit Sail is extremely compact; its dimensions are 15x15x25cm and it weighs just 2kg. Upon deployment, it expands to 5x5m, which is large enough to bring down a satellite of up to seven hundred kilos in weight. The system consists of a set of extremely lightweight carbon-fibre booms supporting a sail made from 7μm thick aluminized Kapton membrane with rip-stops and a telescopic deployment mechanism. 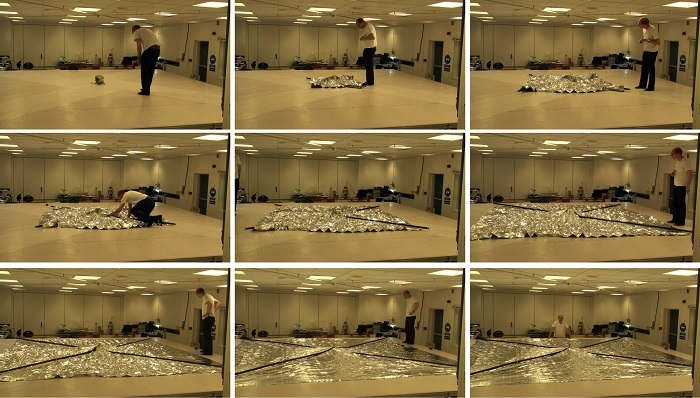 The sail was developed at the University’s Surrey Space Centre, with funding provided through ESA’s ARTES 5.1 program. It has been subjected to rigorous testing, including thermal, vibration, and vacuum tests, and the team hopes to see it deployed in a mission by the end of 2014 by including it as part of another mission. 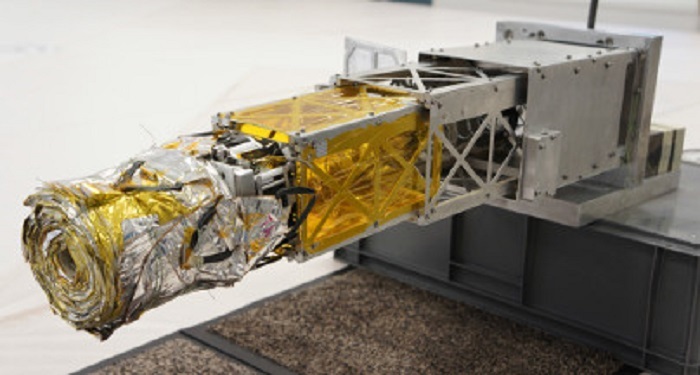 Once the small demonstration satellite is in orbit, the sail will be deployed for testing. The initial tests taking 2-3 weeks will demonstrate solar sailing propulsion. After this, the sail will be rotated to increase the effect of atmospheric drag and so deorbit the test satellite. At an altitude of 600 km, there is enough atmosphere to cause fairly rapid re-entry and it should disintegrate in a mere 2 to 12 months. Under the European Code of Conduct for Space Debris Mitigation, published in 2008, ESA has committed itself to freeing up orbits within 25 years. However, a dormant satellite at an altitude of 750km could easily remain in orbit for a century or longer, forming an obstacle to launching new satellites in that same orbit as well as contributing to the problem of “junk” in space. In LEO, there is still sufficient atmosphere to generate the needed drag using the sail. Even with the sail, it could still take many years for the spacecraft to re-enter and disintegrate. But it would be much more mass-efficient than carrying extra propellant, which would be some ten times heavier. For satellites in orbits above 750km, the sail could potentially make use of solar radiation pressure to perform the necessary end-of-life manoeuvres with the help of an attitude control system. If a deorbit sail is included in future launches, this would ensure that decommissioned satellites can be retired well within the 25-year deadline. In due time, it could also be deployed for other clean-up activities, such as any deorbiting adapter which is jettisoned in the course of launching multiple payloads. “The project has been able to show that the design of a low cost and robust end-of- life deorbiting system not only is possible, but it can also lead to tangible products with a strong commercial interest,” Lappas said.